The big print might attract your attention but it’s the small print that will screw you. We heard recently from someone who had, like many of us, resolved at the beginning of the year to work harder to stay healthy. One decision she took was to join a local gym. So far so good. The gym she selected is a decent, high end place and there was nothing wrong with the service they offered. The problem was in the small print. She signed up for a 12-month membership which she was meant to pay monthly. 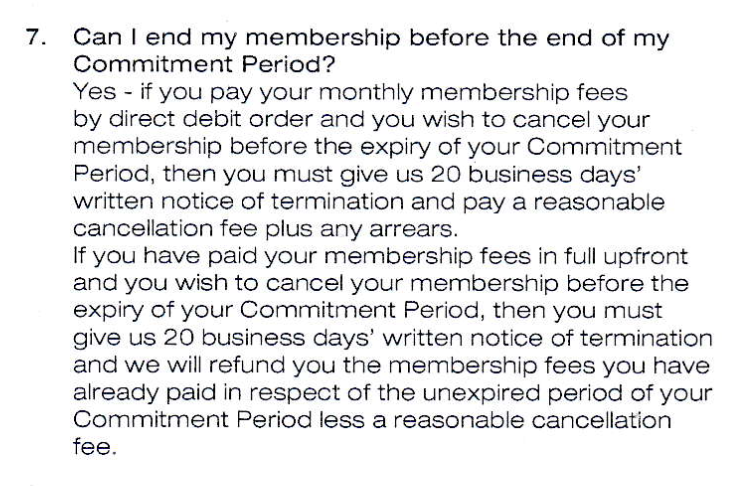 The problem emerged when she changed her mind and asked to cancel the membership after just a month. I should start by saying that despite what some might think, consumers don’t have a right to change their minds after they agree to a deal. Once both sides to an agreement have signed a contract that’s it. The contract can only then be changed or terminated if either both parties agree or if the contract says one party can terminate or change it. The only other time a contract can be terminated is if there was some form of deception or a breach of the terms of the contract. Otherwise both parties are committed. Luckily for this woman, the contract with the gym allowed her to cancel. 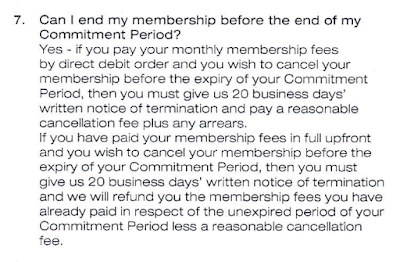 Referring to the 12-month period she had agreed to, the Terms and Conditions asked “Can I end my membership before the end of my Commitment Perlod?”. The answer was very simple. I think that’s perfectly reasonable. It’s going to cause the gym some inconvenience and maybe even some minor costs to cancel her membership so it’s reasonable for them to recover those costs. It’s also reasonable to have a notice period. That’s what happens when you cancel a tenancy agreement, so it shouldn’t be a surprise that a gym membership should work the same way. However, the problem is with three particular words. “Reasonable cancellation fee”. What would you say is a reasonable cancellation fee? P50? P100? In fact the gym’s cancellation fee is 40% of her remaining membership fees. Given that it costs P150 to join, that it then costs P550 each month to remain a member and that she changed her mind after just one month, she’s facing a “reasonable cancellation fee” of P2,420. Are they trying to punish her? Like I said, I don’t have a problem with a “reasonable cancellation fee” but I do have a problem with an unreasonable one. I also don’t think that it’s reasonable to hide these charges. I’m not even sure it can be enforced if the customer didn’t actually agree to it. A clause in an agreement that says one party can do whatever they feel like without explaining it to the other party seems distinctly unreasonable to me. If I included a clause in a contract between us saying that if you wanted to cancel the contract then I can charge you a penalty of “anything I feel like” that would be almost as bad as the “pound of flesh” in an infamous Shakespearean contract. How can you fully understand something that hasn’t been recorded in the agreement? How can you fully understand that they’ll demand 40% of your remaining balance (or a pound of flesh) if you change your mind if you didn’t know that? I like South Africa, I honestly do, and I enjoy spending time there. I also like some of their laws, some of which are better than ours although others aren’t quite as good. But the laws of South Africa belong in South Africa. In Botswana we should expect our laws to apply, not those of a foreign country, no matter how close it might be to us. I believe that a contract signed in Botswana between a person in Botswana with a company that is registered in Botswana, that operates in Botswana and that offers services solely in Botswana should accord with the laws of guess where? Yes, Botswana. But I’ve seen worse. People have told us of the time they went to a furniture store and bought something on hire purchase who were told they can only see the agreement when the goods are delivered. Others have reported that the contract they signed was incomplete, missing an Appendix that’s “kept at Head Office”. Others were given contracts that had been copied so many times they weren’t even legible. You might think that these are exaggerations or even lies told by people experiencing “buyer’s remorse” but that’s not true. When we’ve sent mystery shoppers into such stores wearing hidden cameras they’ve seen the same thing. The videos don’t lie. I’m not suggesting that any of these companies have done anything illegal but I do think they’re being slightly abusive. No, it’s not the crime if the century but I think it’s something we shouldn’t accept. Luckily there are alternatives. You can save rather than buy on hire purchase. You can go to a “prepaid” gym. My son goes to a gym where he pays by the month. He can pay to go in January and then not pay for February. He can start again in March. He’s free to pay as he goes. It’s like buying airtime. You pay for what you use and for many people that’s much better than a contractual commitment, certainly better than a contract that doesn’t tell you everything you need to know. Our theme in 2017 is health. Not just physical health but also your legal health and contractual small print is like a virus. It can hurt you and very few of us have immunity.